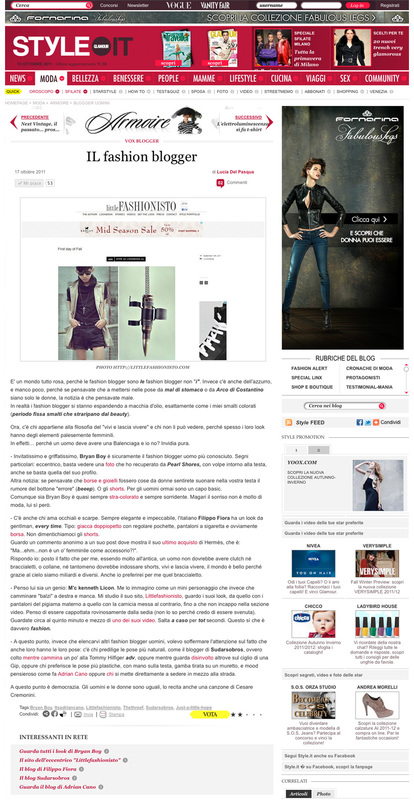 I don’t even know how to start with this blog post, but I was extremely excited when I found out that my blog was featured on Style.it, the Italian counterpart of Style.com. The same article was also featured on Yahoo.it. I mean it might not be a big achievement compare to many accomplished bloggers but I have to admit, it is major for me and it is one step closer to GQ, VMAN, and VOGUE. I have resorted to the power of Google translate but unfortunately, the translation is a bit piece-y and not really making a lot of sense. If any of my lovely followers can read/speak Italian fluently, please help me with the translation as I would love to have the translated article posted on this entry.